Yacht Basya Nicoli Basya Nicoli’ is luxury 82 foot (25 metre) yacht built by renowned British shipyard Sunseeker International. She was made in GRP and delivered in 2004. ‘Basya Nicoli’ comfortably accommodates 8 guests in 4 staterooms, comprising a full beam master cabin, VIP stateroom, double room and a twin guest cabin. All cabins boast ensuite bathroom facilities, air-conditioning and entertainment centres with TV screens, surround sound systems and WiFi internet. In addition, two crew are accommodated in an ensuite twin cabin. Her large saloon has a lounge area with light colored leather sofas, Bose stereo surround system and a 46” Samsung TV screen. A forward dining area with open galley can comfortably accommodate 8 people at a fixed dining table with black leather chairs. 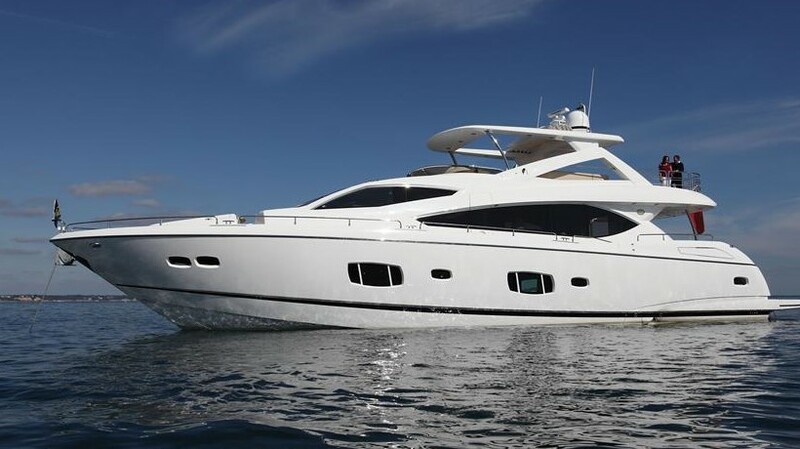 ‘Basya Nicoli’ has a fantastic and very spacious flybridge which includes a wet bar equipped with a BBQ and ice maker, and a seating lounge covered with a bimini top. It also has jet ski crane and comfortable sun pads next to the twin helm position. ‘Basya Nicoli’ is powered with a twin 1,150hp diesel Caterpillar C30 taking her up to 30 knots, with cruising range of 300 nautical miles at 20 knots. Located in Split, Croatia, ‘Basya Nicoli’ is available for viewings upon requests.